The Airbnb apartment that we rented in Fukuoka is small, but full of light and centrally located. We have everything we need to be comfortable in the city for a few weeks. At our request, they installed a washing machine, and we have a good shower, a small but useful kitchen, a light-filled living room and comfortable and clean beds. We have enrolled in WAHAHA Japanese language school, and every week we get to arrange our schedule. We chose to study at WAHAHA, instead of at the more well-known Genki language school, mostly because they were able to offer us an extra curriculum of Manga drawing classes, which the Genki school does not have. From the pictures we’ve seen, Fukuoka Genki school looks a little nicer, with its own cafe where you can sip tea and mingle, which the WAHAHA school does not have. The WAHAHA school gives us free and unlimited tea and snacks, the teachers are all good, kind and patient, and they are flexible and willing to make changes to accommodate all our needs and wishes. Every day we wake up early. We meditate and then eat a light breakfast of a fruit salad with a serving of fresh creamy tofu on which I drizzle a bit of honey or peanut butter. On mornings when we are very hungry, I also make us a small vegetable salad with fresh and pickled vegetables as well. We walk to and from school every day, in order to exercise and stay fit. In fact, we walk miles and miles every day, exploring the city on foot. At first glance, I did not like Fukuoka very much. It has a big red light district that at night is full of drunk business men, girly clubs and lots of smoky and unhealthy food joints. But after a few days, I discovered another side to the city which I like very much. I have ignored what the guidebooks and the Internet suggested are the best places to see and to eat in Fukuoka. Instead, we have met wonderful people and discovered gentle and healthy places to eat, just by trusting our intuition and covering lots of miles on foot. There is lots of great food in Fukuoka, beyond the pop-up Ramen places that open up all around the city after dark. There are lots of good places to eat Korean food, Indian food, Thai food, Hawaiian eggs and pancakes, a few yummy vegan places, good places to eat skewered vegetables, lots of fresh soba and udon places, South Indian food, Italian food, salads and many cafes. It was hard to find a quiet Tully’s cafe or Starbucks cafe in which to relax and do our homework, because the city is buzzing with people. The Starbucks at the Tatsuya Bookstore in Tianjin has its entire second floor set aside for people to bring their school books, chat with each other, and do their homework. It was the best place for us to do our homework. We have learned so much, not by visiting the shops recommended for tourists, but by looking for special events which normally attract only local people who are interested in art, cultural events, and craft exhibitions. We saw an amazing Manga drawing exhibition of 14 global artists who have created and illustrated stories about the Louvre Museum in Paris. We came on the last day of the exhibition, held at the Asian Art Museum, and I was so happy that I got to see it before it closed. Among the other exhibitions that we enjoyed was one showcasing the famous Hakata Dolls. Hakata is the most central and busy part of Fukuoka. These clay dolls have been made in Hakata for hundreds of years. 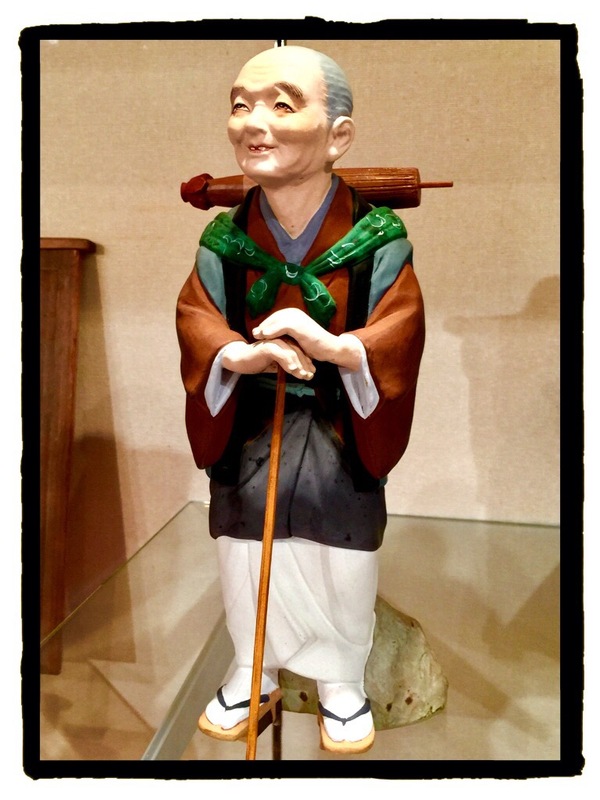 Created by local artists, the dolls depict local figures, Kabuki performers, Samurais, beautiful kimono clad ladies, farmers, children at play, and characters from the Taoist and Buddhist traditions. Historically, each prototype doll was hand-sculpted from clay, but then the artisan made a cast and used the mold to create duplicate clay figures. Some of the figures were very large, and they have been used in street parades as part of the floats that they carry and display at the yearly festivals (matsuri). I am adding to this post some photos of the clay Hakata dolls that we have seen in Fukuoka. The photos depicting children are all light fixtures, which we saw at an exhibition at ACROS, a modernist building in the center of the city which offers theater and music performances. The building has a floating garden decorating one of its exterior facades, and the lush vegetation sprawls out into the streets below. There is lots to do and see in Fukuoka. There are parks full of birds, lakes full of lilies and turtles, large Buddhist temples and even larger Shinto Shrines with huge Tori gates and lots of interesting places to see. The areas surrounding the city are full of beautiful mountains to hike, hot spring Onsens to enjoy, and much to explore. One of our Japanese language teachers suggested to us that since we liked walking the Shikoku 88 temple pilgrimage, that we also walk the mini pilgrimage nearby in Sasaguri. We did a bit of research, but could not find out anything written in English. So we just took the train to Sasaguri and decided that we would describe the pilgrimage for those who might be looking for something to do in Fukuoka that is fun, wholesome and does not involve eating Ramen or going to the places to drink along the river. When I am less busy with school and homework, I will post the information about the Sasaguri 88 temple pilgrimage which we started walking this past weekend, and plan to complete before we leave Fukuoka in a little over a month.